Boy oh boy …… can I talk about this subject! Seems like all my friends are aging, some gracefully, some not so gracefully. I think this aging thing is contagious and vastly overrated. And for those of us who are “aging gracefully”, the biggest real estate trend now is for Next Gen & Granny Pod homes. These homes provide a small studio or 1 bedroom apartment detached or attached to a traditional single family residence. In fact, there is a new subdivision here in Kingsburg that offers this type of home. Several years ago we were seeing homes with “Casitas”, which were typically detached from the main dwelling. 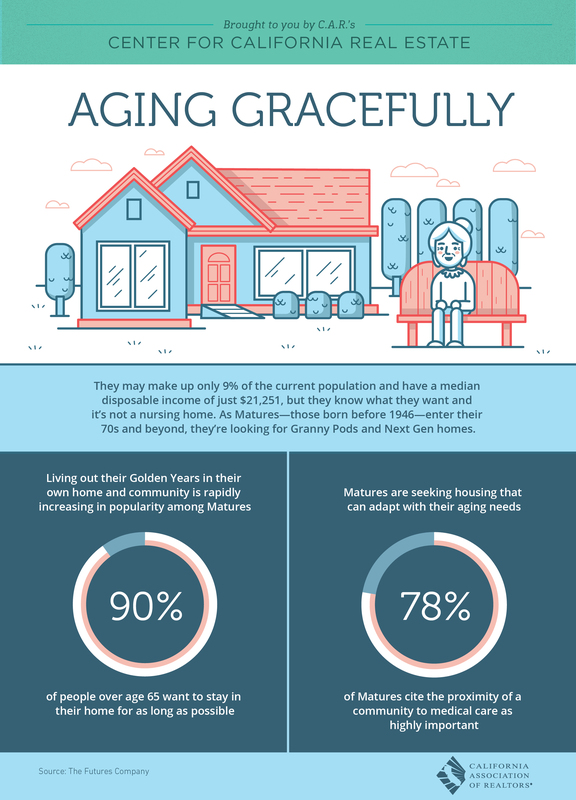 As you can see from the info graphic below, 90% of seniors today want to stay in their homes & communities up to the time they need to go into assisted living facilities and this newer style of home provides these two benefits. The past several months the real estate market has pretty much stayed stagnant. We had 25 Active listings (which is still very low inventory) and had 7 sold properties. The average price per square foot of Sold homes was $145, down a little from July. Property values have dropped just a little over the past few months and lower appraisals are driving that train. Maybe we are being too optimistic about values when we list to sell homes. Saturday, September 24, 2016. A tribute festival to local farmers. 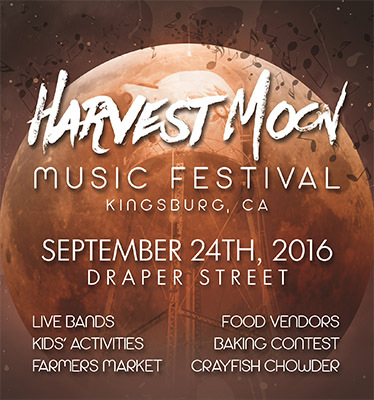 Featuring bands, famous food trucks, beer garden, Crayfish Chowder, and more! A fun early-fall evening.